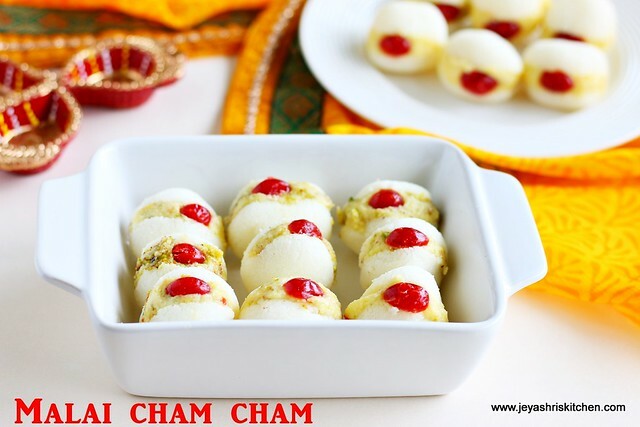 Cham cham | Chum chum is a traditional Bengali recipe, which is made with chena and stuffed with malai | khoya. We used to get this from a famous sweet shop in my hometown Madurai, Zam Zam sweets. The juicy cham cham are our most favorite ones. Traditionally they are made in oblong shape and slit and stuffed with khoya and nuts. Sometimes they are just rolled on desicatted coconut. Sometimes they are just served as it is garnished with pistachios. It is more like the dry jamun, we can say dry rasgulla. I wanted to try this at home from scratch but was thought in the last minute if i post some easy and instant sweet recipes, that will be helpful for all. Especially working women, bachelors and women with small kids and elderly people at home who can't spend much time in the kitchen, can do this exoctic sweet for this diwali. Check out my 5 easy diwali recipes. Also check the instant rasmalai recipe too. I used haldirams rasgulla and store bought khoya, you can use homemade rasgulla and instant khoya too. Even you can use store bought palkova too else check out my 10 min palkova recipe too. Open the rasgulla tin and drain out the syrup from that. Gently squeeze out the extra syrup from the rasagulla and arrange it in a plate. Soak saffron in warm milk for 5 minutes. In a bowl add khoya and sugar. Bring the khoya to room temperature. Add the saffron milk to this. Add the cardamom powder to this. Mix well with hands and it will be soft. Take one rasgulla and slit it with a sharp knife. Do not slit it fully. Stuff little khoya mixture into this and just press the opening gently. Press on cherry in the middle . If you do not have cherry, you can put one pistachio too. Repeat this for the rest of the rasgullas. You can add some ground pistachios and almonds to the khoya mixture to make it more richer. As given in my lavang latika recipe you can add dry coconut to the khoya mixture. You can roll the cham cham in desiccated coconut too. If you are planning to make this from scratch, make rasgullas but make thiem in oblong shape instead of round and continue with the slitting and stuffing process. Great idea :) I will try it once! That's a lovely idea to jazz up store bought rasgullas. Happy Diwali to you and your family Jeyashri. 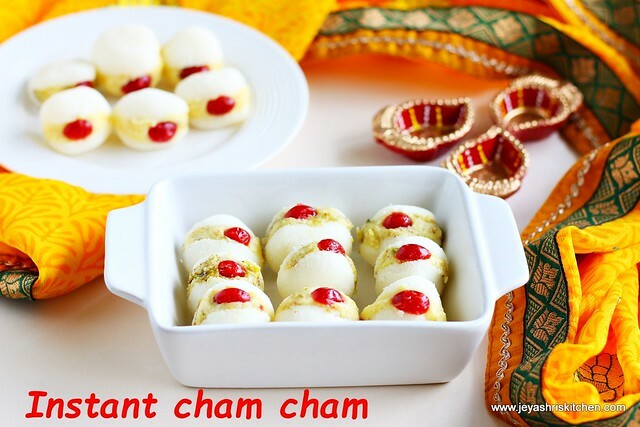 When I was a child my grandpa brought these cham chams sweets. It was the first time I got an intro to these delicacies and since then I fell in love with them. Being a child though I love them I couldn't eat a single chum chum all by myself. But now I eat 2 to 3 chum chums in a single go hahahaaaa. Loved your little chum chums and thanks for posting such an easy method of preparing them in home.